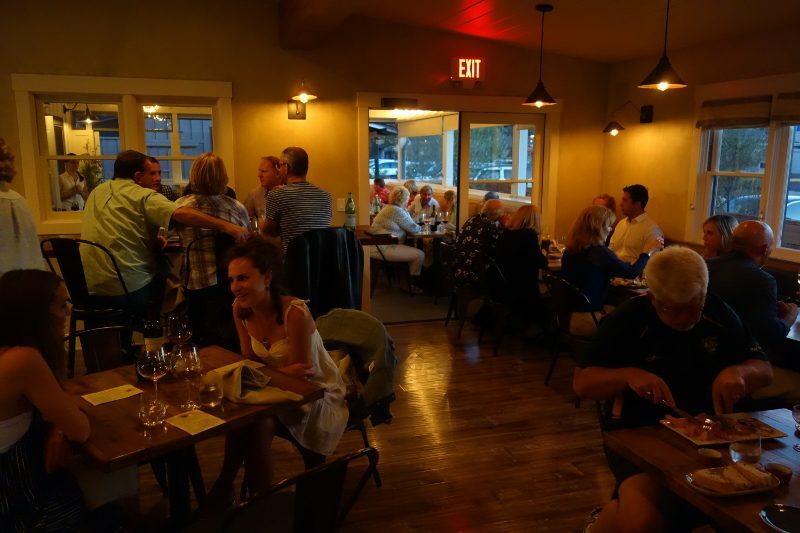 With all of the amazing wines coming out of the Santa Ynez Valley, it is only fitting that good restaurants follow. And probably the hottest destination right now, after a day of wine tasting, is S.Y. Kitchen in the town of Santa Ynez. For Los Angelenos, there may be some recognizable faces. Mike and Kathie Gordon who own Toscana restaurant and Bar Toscana in Brentwood are the proprietors. 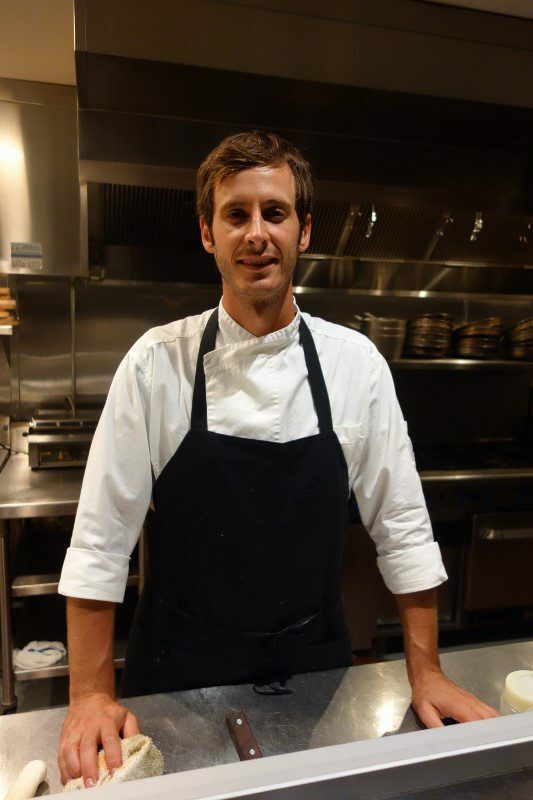 Chef Luca Crestanelli, formerly at Bar Toscana, created the California-Italian menu. And you will also find his brother Francesco, who is the Sous/Pastry Chef in the open kitchen. S.Y. Kitchen is in what looks like an old house. When you first walk in, there is a fire pit with seating. There are three dining rooms. The first one is where the bar and open kitchen are. It is a loud and energetic room. This room then feeds into two other rooms – the patio and a quieter dining room, where we dined. 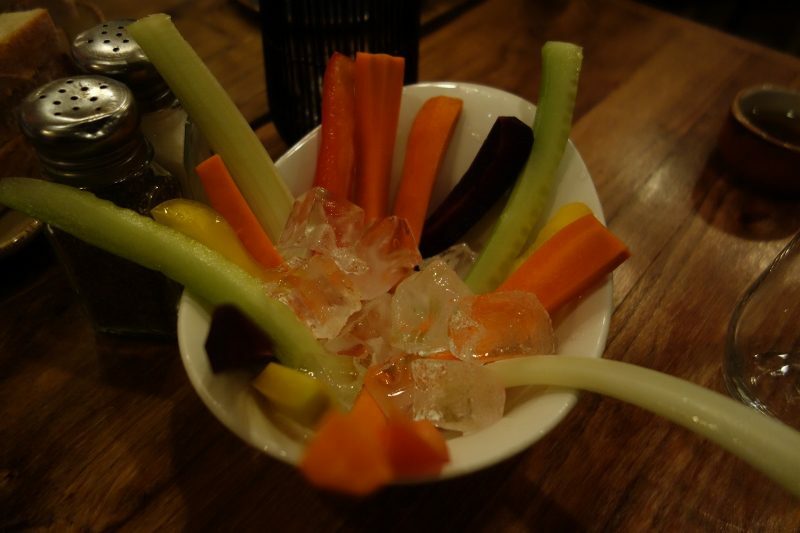 The service started with a bright bowl of crudites (red peppers, carrots, celery). This is a very traditional Italian thing to do. And, it is actually nice to munch on some fresh vegetables while reading through the menu. We ordered two appetizers to start. 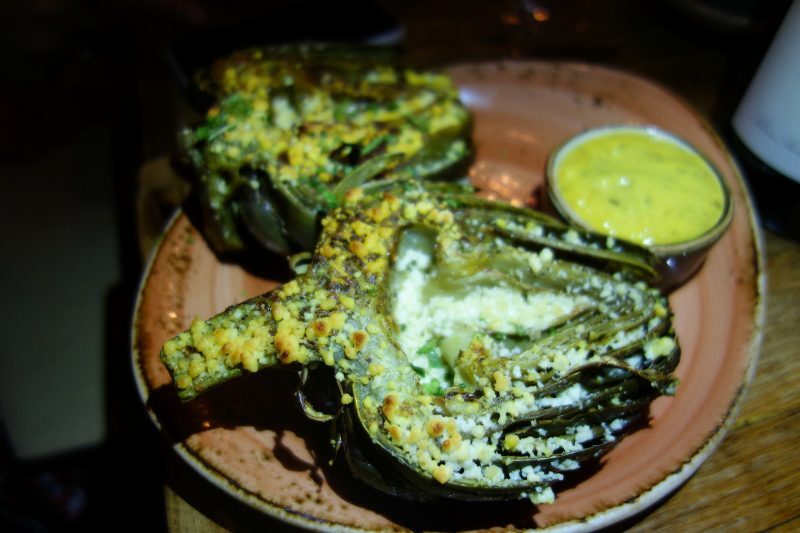 Artichokes may be a lot of work to eat but the Baked Artichoke with fresh thyme, parmigiano and Mediterranean style mayo was worth the effort. 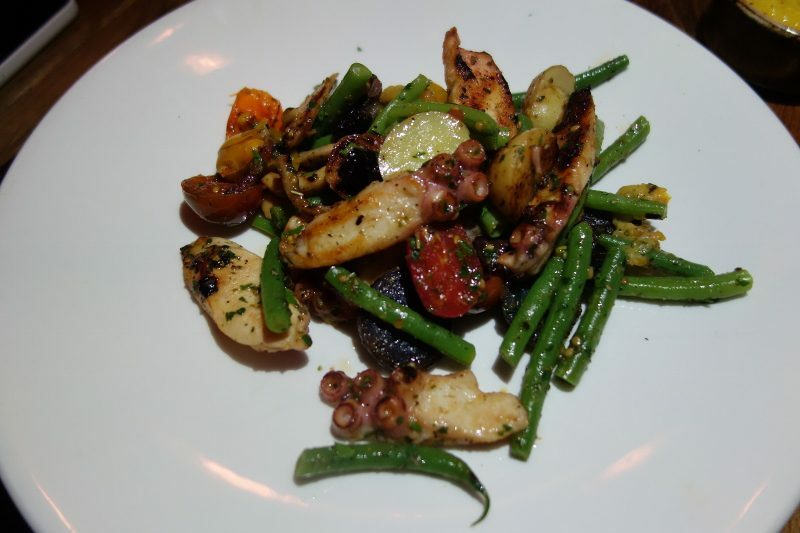 And the Warm Octopus Salad with taggiasca olives, potatoes, cherry tomatoes and haricot verts was tender and light. Next we ordered a pasta dish. 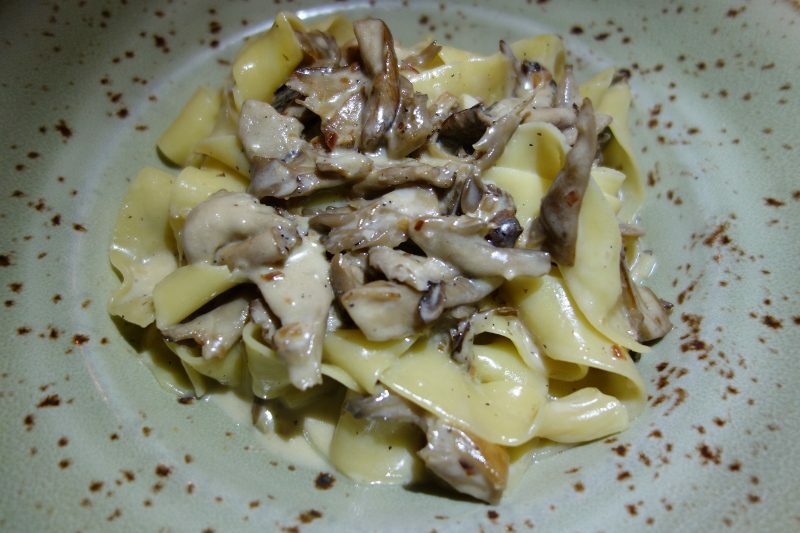 The Wild Mushroom Pappardelle with thyme and parmigiano was simple but exquisite. There really is nothing better than fresh homemade pasta and the fresh mushrooms were meaty and full of flavor. 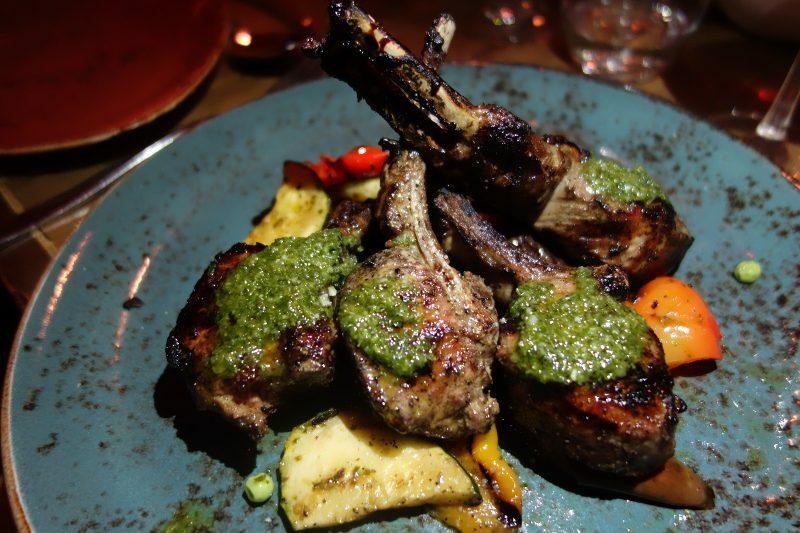 Our final dish was the Baby Lamb Chops with grilled vegetables and fresh herbs from the oak fired grill. The char was perfect on the lamb chops, but underneath the meat was tender and pink, almost like butter to eat. S.Y. 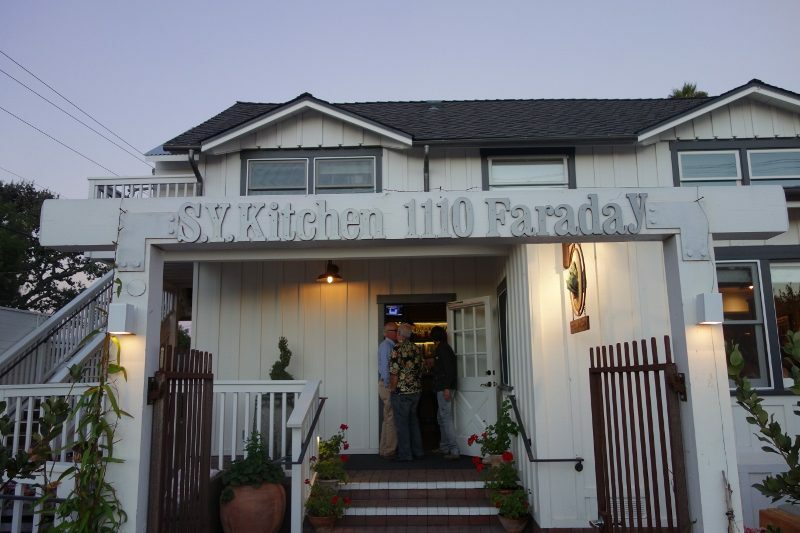 Kitchen is a definite must-stop when you are in Santa Barbara wine country. A casual, rustic meal is the perfect end to a day of wine tasting. This entry was posted in Food and tagged food, Francesco Crestanelli, S.Y. Kitchen, Santa Barbara, Santa Barbara Wine Country, Santa Ynez, wine country by Allison Levine.